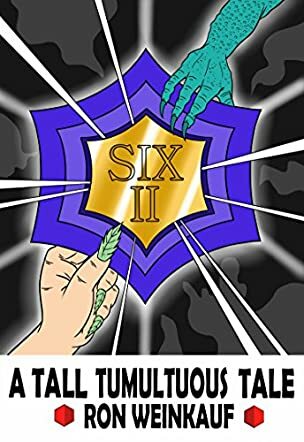 Six II: A Tall Tumultuous Tale by Ron Weinkauf is a hilarious science fiction story with unusual characters and fraught with unwonted hilarity. It starts aboard a spaceship bound for Earth. The astronauts - Liza, Horatio, and Easy, together with Otto, the little dog - are awakened from their slumber by their Commander, Sonny, who has just discovered that one of his hands looks different, golden. They have had extraordinary experiences on the six-sided crystal and while Sonny has a transformed hand, the others equally feel different physically. It’s the beginning of a great adventure involving a sorcerer, a tale of love, and an imaginary world in which readers will feel at home. Ron Weinkauf has written a story that is unique. This author has a gift for dialogues and these stand out in that they capture the slang of a specific milieu brilliantly and allow character traits to come out while exploring elements of the plot and the conflict. Character development is skillfully handled and readers will want to follow these characters as they evolve through the story. The themes of teamwork, friendship, love, and adventure are beautifully woven into the fabric of this story. The plot points are fairly good, but what caught my attention was the fun nature of the characters and the dialogues. The story starts with a humorously dramatic incident that incites the curiosity of the reader, and moves on from one oddity to the next. Six II: A Tall Tumultuous Tale offers vivid images with the world building, and characters that make for great companions. I loved it! Six II: A Tall Tumultuous Tale by Ron Weinkauf is a very witty, humorous and exceptionally well-written story that I thoroughly enjoyed. Like the title says, this is a tall tale, but the author does a great job at making sure that this tall tale is interesting for everyone who reads it. There are bits and pieces that are too hilarious to read without wiping tears from your eyes and then there are some parts that had me pause and reflect on what just happened and how it will impact the story ahead. This is the story of a team of astronauts on board a space ship returning to Earth. While Liza, Easy, Horatio and their dog, Otto, are sleeping, their commander, Sonny, wakes up to find that he has changed physically. Coming back home from an extraordinary place, Sonny discovers that his hands are turning golden and the rest of his team is also finding changes in their bodies. After their experience on the six-sided crystal, they were bound to feel some changes, but they had no idea that these changes would be so serious. Adding more to the complexity of the situation, there is a sorcerer who is toying with their emotions and their minds. What will happen to these astronauts? The narrative of the story is unique and brought something new to the table. What really grabbed my attention were the dialogues because they felt very natural and they flowed very smoothly. The characters were developed in such a way that I wanted to get to know them more and wanted to delve deeper into their story lines. All of them had their own traits that set them apart from the other characters. Six II: A Tall Tumultuous Tale is a fantastic story that felt real because of the characters and their ability to connect with the reader. I loved it and enjoyed it immensely! Brilliant! Six II: A Tall Tumultuous Tale is a work of science fiction by author Ron Weinkauf, and is the follow up to Six: A Tall Titillating Tale. After the experimental escapades of their first adventure, a crew of astronauts plus one plucky little dog are about to experience a whole new level of weirdness on their return journey to Earth. Waking from sleep, our central hero Commander Sonny notices at once that his physicality has changed whilst he’s been out cold, as has that of his other crew mates. This complicates the relationships between the astronauts further than ever, and lurking on the mysterious crystal is a sorcerer who thoroughly enjoys whipping their emotions up into a frenzy. Space opera, weird science and a Dr. Seuss-like knack for rhyme all combine in this bizarre but satisfying science fiction work. Six II: A Tall Tumultuous Tale is written partially in verse and rhyme, with poetic techniques that stamp it with a deliberate wry humor. Author Ron Weinkauf has clearly worked hard on the characters and the humorous ways in which their interpersonal relationships are presented, particularly his leading man Sonny, who smacks of Captain Kirk for me from the very first page. The plot doesn’t always make sense, and the writing isn’t always as polished as it could be, but readers who enjoy the heights of parody are sure to giggle from cover to cover. Fans of Galaxy Quest and Mars Attacks, this is the next book on your reading list! Six II: A Tall Tumultuous Tale by Ron Weinkauf finds a group of astronauts and their dog making the long journey back home to Earth. When the group awakens, they make a series of startling discoveries, starting with Commander Sonny's hand suddenly more golden than he remembers it being. That's only the beginning of the strangeness the group will face. They anxiously await uncovering more about the mysterious wall, and must undergo a series of rather bizarre adventures filled with characters both famous and new. Ron Weinkauf has a unique flair with words as this entire world is brought to life through the way the language is arranged, with oddities in the dialogue and delightful humor in the tone. The dialogue often has a rhyme scheme with rhyming words at the end of different characters' lines that gives a lyrical quality to the writing while moving the story along faster and making for a quicker read. The play on words range with words like chump and champ, to a series of words in quick dialogue like prudent, perfect, and peachy, giving the language a playful and light tone. Weinkauf has a precise way of wording every phrase, choosing exact words that play off the previous line and creating a rhythm. Pop culture and mythology play a large role in this fun mash up world, with everything from history to fairy tales and fun references to Medusa and Santa Claus, a menu taken from the Titanic, Western stars John Wayne and Roy Rogers, a memorable moment with Miss Muffet, and a brief mention of the four horsemen. The characters are bizarre and seem to flow together with this unique and colorful world which has layers of science fiction. Along the way, the group encounters several alien-like creatures like a giant praying mantis, each leading to several jokes and puns; the mantis led to jokes about intergalactic bug spray and plays on the use of the word bug. The main characters are completely accepting of their bizarre surroundings, but are also just as eccentric as the world they're fitting into. Every situation seems to be taken with humor as Six II finds this group of eccentric characters facing a series of weird adventures while dealing with love and life.